IMAGE: An artist's impression of the cycle route between the footpath and parked cars -- council officials said that red surfacing shown would not be used as it would be out of place on the historic street setting. 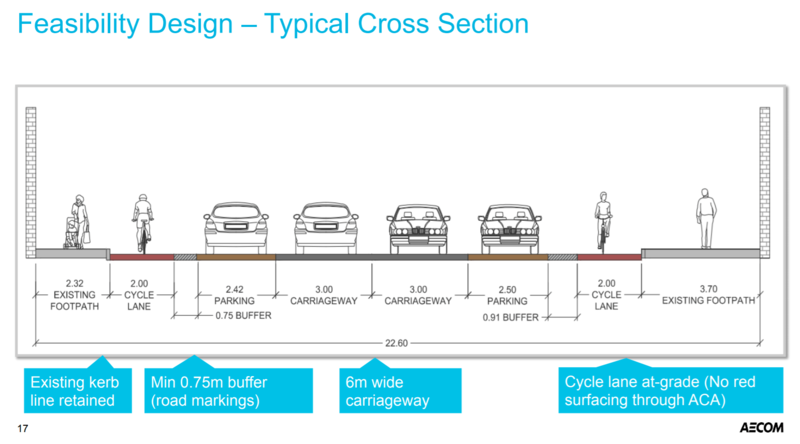 — Some councillors concerned about lower amount of car parking and people accessing cars across cycle lane, as well as potential loss of turning lanes. 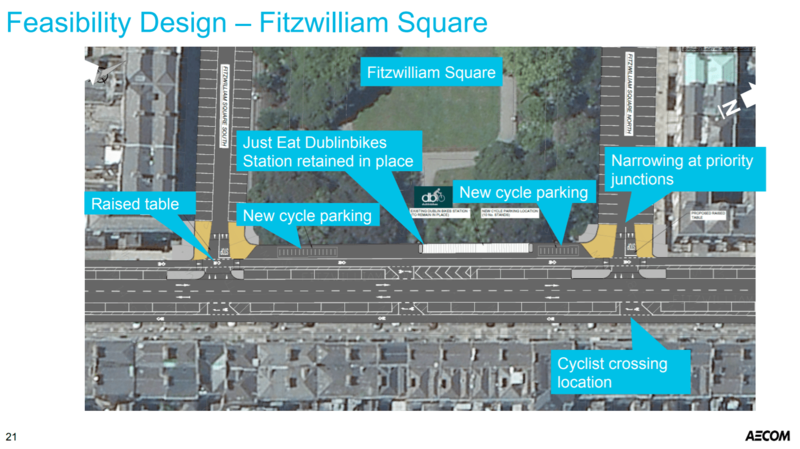 LONG READ: Consultants for Dublin City Council are developing a design for the parking-protected Fitzwilliam Cycle Route with public consultation due to take place in August and September with construction in early 2019. The route — which was promoted by Cllr Paddy Smyth (FG) — will go from Leeson Street to Mount Street Lower, running along Fitzwilliam Place, Fitzwilliam Street, and Merrion Square East. There will also be a link to the Grand Canal cycle route via Lad Lane. The design will mainly involve changing perpendicular car parking to parallel parking, and switching where people cycle from outside the cars to inside the cars. Raised treatments will be used at minor junctions while the design team is working on Dutch-inspired protected corners for the main junctions on the route. The cross section will include the existing footpaths, a unidirectional two metre wide cycle lanes on both sides of the streets, buffers for car doors and car parking, and general traffic lanes. Joe Seymour, director with consultant Aecom, said said that aim was to create a safe and attractive route. He said while it runs parallel to the Grand Canal route, that route is “already very, very busy and additional routes are required in the area”. Speaking to councillors at the South East Area Committee meeting on July 9, Seymour said that there the area has quite a few workplaces including Linkedin and the ESB. He said at peak times there’s already nearly more people cycling than people in cars on the streets which make up the route, but the perception can be that cars far outnumber bicycles because cars get stuck in traffic, while bicycles move more freely. IMAGE: An example cross-section of the new layout. The existing layout of the includes some sections of unprotected cycle lanes and that there is a need to provide bicycle parking on the street. Features of the street, including historic granite kerbs and coal holes, will stay in place and not to be moved as part of the project, and footpath build-outs will be constructed using materials sympathetic to the nature of the street. Electric car charging points will be moved to the outside of the protected cycle lane, while an original plan to move the DublinBikes stations away from the footpaths will not proceed. IMAGE: The designers of the route said that work has still to be done on the project’s junctions but it is intended to included protected space for cycling, like that planned for the Clontarf to City Centre Cycle Route. Designs shown are a work in progress. He said that the design is not yet finalised and that the designs will have to take BusConnects into account. “We’re working on a protected junction for the cyclists which will take a little more work but the intention is that the cyclists will have its own area slightly protected from the traffic on the approach and going around the junction as much as possable. 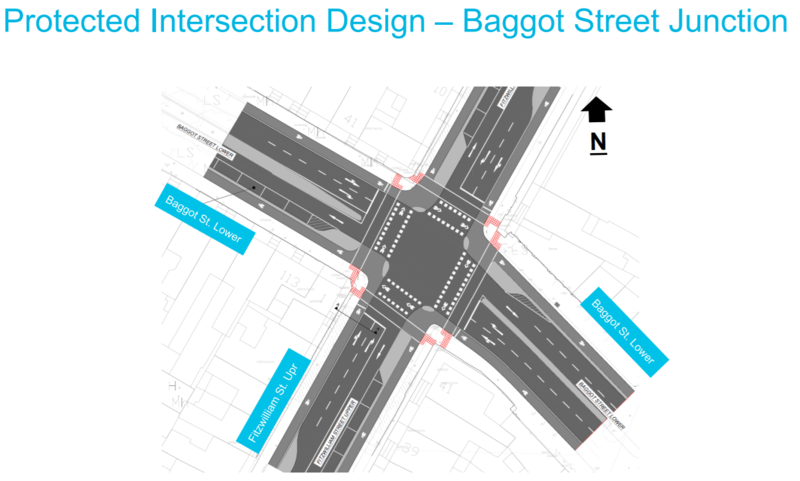 Seymour said that the design of the junction between Merrion Square East and Holles Street needs to be worked on and is now included in the project. It would also include making the streets more pedestrian-friendly, by slowing down cars, adding build-outs and raised crossing, and fixing elements such as lighting polls positioned in the middle of existing crossings. He said the impact on car parking is the most significant change in the project, but he said that the existing perpendicular parking is a danger to road users and there is scope to reduce the number of car par parking spaces. He said that there will be a shortfall in car parking along the streets but spare capacity on four side roads will cater for the shortfall. He said project will be planned using the Road Traffic Acts, a process where council officials, not councillors, have the final say, and that is is to be “one of the exemplar project to be showcased for Velocity”, which Dublin City is hosting in June 2019. “I live, drive and cycle around there on a regularise bases and the reason I welcome it is because a lot of people are using the Grand Canal Cycleway as a way of getting into town and while if this is built as a proper spur to the Grand Canal Cycleway, people will use it from Leeson Street to the Docklands.” He said he can see the junctions as an issue especially given that cars are already backed up on them at peak times. IMAGE: There is planned to be raised tables and narrowing at junctions to slow down motorists and make it safer for walking and cycling. We reported on the comments from Cllr Mannix Flynn the day after the meeting — see that news report here. Cllr Mary Freehill (Labour) — who recently was one of the main objectors to the South Dublin Quietway — said she had a number of issues with the plan and she could not understand why the cars will be placed to protect the cycle lane. She referenced the experience with parking outside cycle paths in an unclear location in “Stillorgan or somewhere out there” where there was “near misses” between car users and people cycling. Christopher Manzira, from the council’s transport department, said they will take on Cllr Freehill’s comments on the junctions. Manzira said that there is a buffer and the aim is to provide of between at least 0.7-0.8 metres of a buffer between a parked car and the cycle lane and this will allow space for people to open car doors and get out without going into the cycle lane. Joe Seymour said that the designs are still and work in progress and the final designs would take into account of sightlines. Local area chairman, Cllr Ruairi McGinley, commented that they were not going to design the route inside the council chamber, and that he was not going to go back over the presentation. Cllr Anne Feeney (FG) said she welcomed the project and the consultation was hugely important. She said it is a pity the route does not continue past Holles Street. She suggested also looking at cycle lanes in the middle of the road, but officials said that people would not feel safe in the middle of the road between motorised traffic. She said that a focus also needs to be put on surfacing of existing cycle lanes as she was nearly “jettisoned” off a DublinBike due to poor surfacing as she cycled to the meeting. Cllr Claire Byrne (Greens) welcomed members of the South Georgian Core Residents Association in the council chamber’s gallery. “Obviously as a cyclist and a Green Party representative I support any investment in delivery of cycling infrastructure in the city. I cycled yesterday with the Dublin Cycling Campaign down the Liffey to highlight the need to deliver the Liffey Cycle Route among other projects — we need serious investment in the city and we need it fast,” said Cllr Byrne. Cllr Byrne said that parking would also be an issue and if there could be any plan to protect parking for residents. She said that residents were also concerned that about accessing cars with wheelchairs or buggies. She said that of the main questions that residents have is why is this route being prioritised over, for example, Leeson Street. Council official Christopher Manzira said that the routes on main roads are expected to be covered under BusConnects, which includes proposals on Leeson Street and Baggot Street. According to the Census 2016, of the ‘small areas’ along the street, 106 residents commute by bicycle while 97 commuted by car, but not all of these use on-street parking and by far most residents walked to work or school. Council officials said that that just 54 residential parking permits are available along the streets of the route, while the council’s consultants said that at night there will still be significant free capacity available. Within the study area of the streets on the route and four side street, there will be 580 car parking spaces. This will fill a peak demand of 573 cars and demand drops to around 300 cars by 5pm and just 100-150 cars at night. Cllr Lacey said that as somebody who has been knocked off his bicycle three times by car doors opening that he is a bit weary of a painted line buffer. He also wanted bicycle parking spread along the streets in a number of smaller bays rather than one or two large ones. I watched the council meeting. How could anyone sit and watch the presentation, and then ask that question? Cllr Freehill is obviously either amazingly stupid or amazingly ignorant of cycling, or both. Whichever it is, she’s shown herself to be incapable of having any constructive input on cycling topics and shouldn’t be allowed to vote on them. Cllr Freehil is clearly against cycling provisions in general but has no logical or coherent argument to make against this project. She is reduced to raising spurious points based on at best hearsay and at worst fabrication. Clearly, despite making her appear foolish and unreasonable, this approach isn’t going to lose her any votes. There’s a clearly irrational bias on how Mary Freehil conducts her business in relation to cycling projects. Cyclists need to get political, and start making lists of councillors to target for a) getting behind pro-cycling candidates and canvassing hard for the next election and b) pushing pro-cycling candidates into standing in areas currently served (?) by anti-infra people. The Labour Party generally seems pretty pro-car – what’s the story there? The party of the petty bourgeoisie now? I certainly won’t say no to any help canvassing before the next council election in May. There’s a huge lobby for the status quo so if you want to see things improve you need to get behind (actively) pro cycling/walking candidates. Great to see this getting strong support from councilors (except for the usual suspects). I have cycled this route a few times and I find it very threatening. The perpendicular cars are a real hazard, particularly when reversing on to the road. I would not bring my family on the current route. Well done Paddy for getting to this stage. I thought it was interesting to hear the engineer confirm that the impact to parking will be negligible. That means the current allocation of road space is inappropriate, with too much given to cars where there is low demand. If this project is not supported, there will be some questions to answer about the use of public space, and resources. Public information meeting this evening (Monday 23rd) in Pearse St Library, from 5:30. Crois I support this project so how can You make that assertion.